Springtime has been hopelessly late here in Alberta, so I decided to go ahead and celebrate it anyhow, by making myself a new shirt. And shortened the sleeves, as I have short arms. BUT… I blythely cut it out and sewed it up in, ahem, my husband’s size, oops…. so it is too big for me. 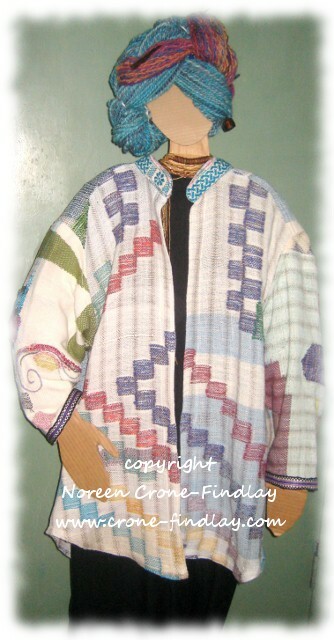 I did all kinds of clasped weft and inlay on body of the shirt. These are techniques that are used a lot in Saori weaving. 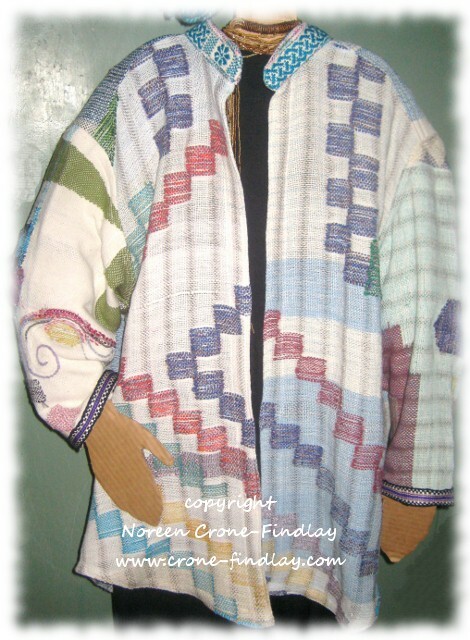 Saori is weaving based on the philosophy of creative self discovery through free form weaving. At times, when I was weaving the little squares, I had up to 8 extra shuttles in the row. Doing inlaid sections slows down the weaving process, but it is really worth it. 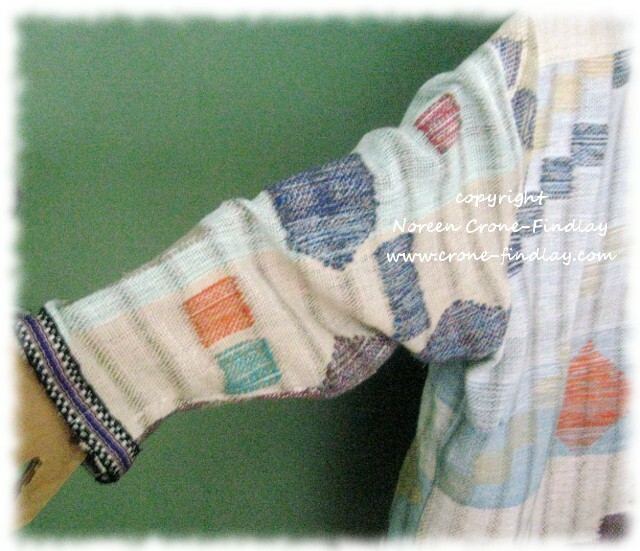 I used inkle woven bands for the collar and cuffs. I am not going to put buttons on it, as I don’t think that I would ever wear it buttoned up. So, this is my celebration of Spring…. hope you are celebrating merrily, too! Today, on facebook, the National Parks of Canada said that it is ‘World Wide Water Day’. the sacred drop of water. 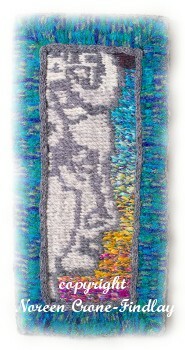 ‘Woven Women- Our Lady of the Waters’ is a mixed media tapestry, including wool yarn, stones, wire and pounded metal. 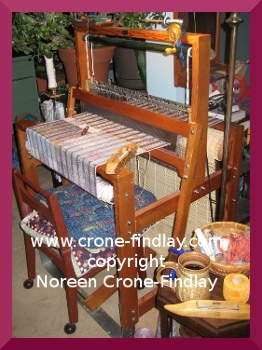 I wove her with several different looms: A tapestry loom, a 2 harness table loom, a 2 harness Saori floor loom, a peg loom and also used a spool knitter. She’s 28 inches tall by 11 1/2 inches wide. I think that she is probably my favorite piece that I have ever woven. 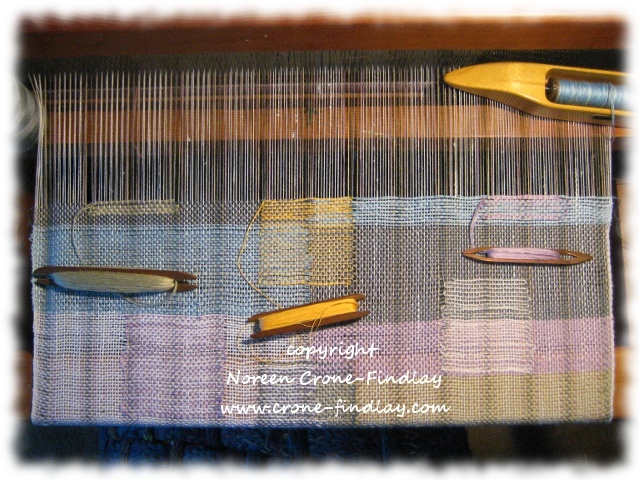 Here’s a closeup of a section that I wove on the table loom at 15 epi. 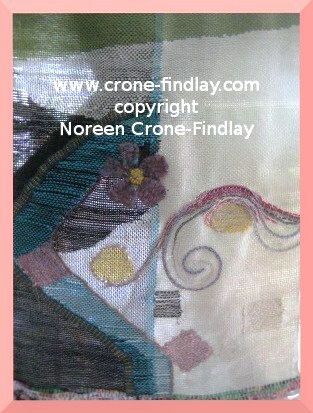 I used tabby, inlay, soumak, clasped weft and embroidery. 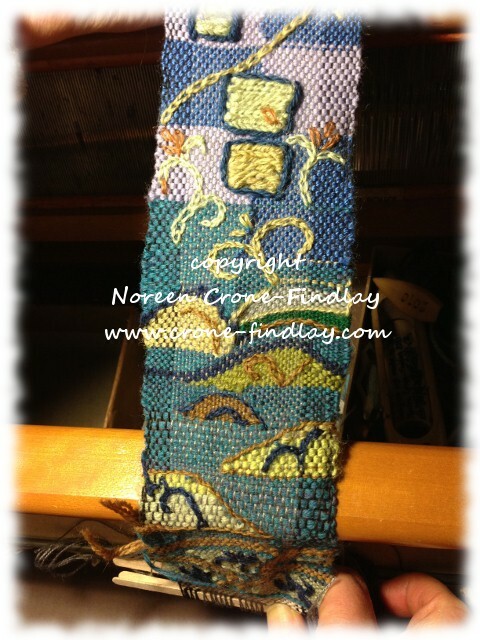 When faced with challenges, one of the ways I work my way through them is to weave. This tapestry is the result of dealing with a huge challenge- how to cope with difficult news about the health of my beloved daughter. 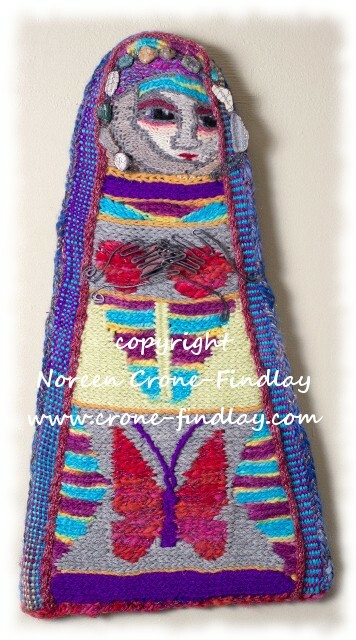 This piece is called: ‘Woven Women- Uncertainty’, and she has a little poem…. 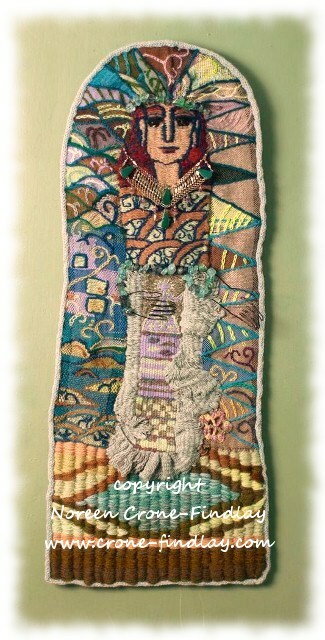 She’s a mixed media piece, woven in soumak, with inkle bands and spool knitted cords. I spool knitted wire to encapsulate sea glass, seashell fragments and pottery shards. Her hands are shaped from wire, and they clasp a purpleheart wooden heart. She’s approximately 20 inches tall by 11 inches at the base. 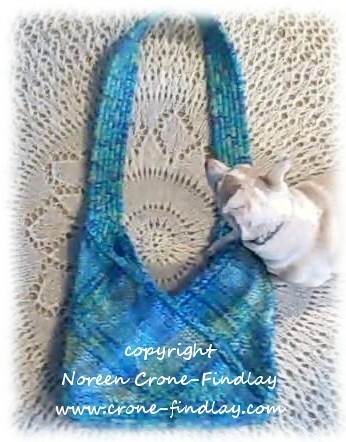 This bag is a great way to showcase handspun yarns, art yarns, tarn or other special yarns. It’s VERY comfortable to wear across your body. Wearing across like this keeps it closed. If you don’t wear your bag across, then you’ll want to make a shorter strap, and add a button at the ‘V’. The hypotenuse of the triangles have cords made on the lucet (a spool knitter works just as well) to stabilize the edges. The sides, base and handle are woven as one continuous piece on 6 weaving sticks. There’s a pocket on the front and also on the back of the bag, for business cards, glasses, cellphones, lip gloss, etc.